Albert van der Sel : Some keypoints of Quantum Computing. In the series: Note 3. Subject: A simple note on Quantum Computing (QC). This note is a trial to show a few highlights on "Quantum Computing" (QC). like to learn "practical" physics quickly. Then you can skip this note, which is no problem, and go for other notes. However, it's facinating stuff, and it's getting more and more important as time goes on. That's why it is certainly recommended to aquire at least "some basics" on QC. But keep in mind that this note is no more than a simple overview on some highlights of QC. like some basics of the architecture. It does not have to be a tremendously high level, just a little is good enough. But it certainly helps to have a certain basis in math, especially the basics on vectors. Maybe you like to take a look at my "math note 12: Vector calculus Part 1", first. This note: Note 3: A simple note on Quantum Computing (QC). 1. Introduction and what we need to know first. 2. A few words on Operators, Gates/circuits, kets. 3. Quantum Information vs Classical Information. Chapter 1. Introduction and what we need to know first. are (still) only used for performing some specific mathematical operations. which was an enormous stimulus for starting the practical implementations of QC. It's not to be expected that you will perform all sorts of comodity programs (like email), on a Quantum Computer, very soon. For now, a number of specific quantum algolrithms are under study, and some have been successfully implemented. As you will see, those "quantum algolrithms" were developed, and implemented in "quantum circuits", in lab setups. It's probably fair to say that most lab setups (july 2015) still work with 2, 3, 4 or up to 8 qubits, or a few more. just as manifest and "physically permanent" as real (and traditional) electronic devices are. So, most often, that's not so. 1.2 Bits in classical computing. all for storing (or transporting) sequences of "0's" and "1's", which physically are Voltages. while a "0" corresponds to 0 Volt. whithout changing that content. Also, you can copy the content to another register, or to a remote computer etc.. No problems here. operation does not change the value of the memory cell. Indeed, it's important to note that the contents of memory cells do not change if you just "observe" them (read them). 1.3 The Quantum Bit: qubit. In the Quantum World, things are a bit different. And so is QC. The "basic" entity in QC is the "qubit", which is the "quantum bit", and it plays a similar role as the "1" and "0"
However, the state of a qubit is unknown, up to the point when you observe it. It may sound strange (which it is), and I try to explain it now. truly the role of the qubit. For example, it can be the "spin" of an electron, or the "polarization" of a photon. the spin is a linear combination of both "up" and "down" at the same time. In Quantum language, the spin is a "superposition" of the basis (or eigen-) states |0> and |1>. so the sum of all probabilities must (evidently) add up to '1'. as a sum of basis vectors, like |0> along the x-axis, and |1> along the y-axis. Actually, in the 2-dim vector space analogy, we should (maybe) have used (0,1) and (0,-1) to decribe "up" and "down". However, (0,-1) = -1 x (0,1), so here we just don't have 2 independent basis vectors which can "span" (or describe) this 2-dim space. This is why I choose the analogy of |0> along the x-axis, and |1> along the y-axis. it's also very important to realize that |Ψ> is a superposition of |0> and |1> simultaneously. You may also say that |Ψ> has a two-dimensional state space, formed with an orthonormal basis usually depicted by |0> and |1>. or infinitesemale space, where it can be written as a superposition of basis vectors (or superposition of eigen vectors). You do not know the state. If you measure the observable, the state "collapse" into one of the basis vectors with a certain probability. and many models have been proposed. You can't say that it is all resolved. Many questions from physics remain, and it also is important for other fields, e.g. philosophy. a "wave packet". In QM, particles often exibit a wave-like character, and waves, often exibit a particle-like character. When we look at the "position" of a particle (even at rest), then it resembles a "church bell" shaped wave/probability distribution. it at the very edges of the (church-like) bell wavepacket. can be written as a large summation of Sinusoidal functions (or cosinus), with certain phases and coefficients. The more of such parts you add, the more accurate your summation will resemble the original function (Fourier analysis). You don't need to remember this, but a two (non-entangled) qubit system has the following four basis vectors |00>, |01>, |10>, and |11>. a certain state after a measurement. For instance, |a00|2 is the probability of obtaining |00>. Folks then say that after the measurement, the state |Ψ> "collapsed" (or decohered) into |00> (with a probability |a|2). The "|00>" is a shorthand for saying that the first qubit then was found to be |0>, and the second one was found to be as |0> too. Note that the equation above is just the (outer) product of 2 qubits, like in "(a|0> + c|1>) X (b|0> + d|1>)". The qubits are not "intertwined" (entangled), and a measurement on qubit "1", does not fully determinate for what we may find for qubit "2". has a certain probability that it will be found in the state |0>, or as to be in the state |1>. In this case, the vector can be expanded into 8 basis states (|000> up to |111>). We will use this one in chapter 4.
then they are called 'entangled'. So, what you find if you measure qubit 1, will immediately determine the state for qubit 2. Maybe you don't see this as to be very remarkable right now, but it actually really is vey "remarkable". It simply means that if you measure qubit 1 as to be |0>, it determines that qubit 2 will be observed as |0> as well. in a measurement. But this is true for Lab 1, as well as for Lab 2. But strangely, what you will measure in Lab 1, will immediately determine what you can find in Lab 2.
as we have seen in "case 1" and "case 2". of all 2n possible "values" (states actually), at the same time ! Now compare that to a traditional "classical" register. Suppose we have 4 classical memory cells. Now, it can hold 1111, or 1010, or other combination, but only one at the same time. If we have 4 qubits, in a quantum register, we have all states simultanuously (like |0000>, |0101> etc...). But this is not the whole story. Measuring a statevector, projects it, or let it collapse, to one basis state. Most of the "trick" to obtain usefull information, is in the "quantum algolritm" itself. In this note, we will take an "ultra-light" look at one of the simplest ones, namely "Grover's search algolrithm". In quantum systems, indeed the computational space increases exponentially with the number of qubits. This, in principle, enables exponential parallelism. This could lead to exponentially faster quantum algorithms, than which is possible using classical methods. and that is the hard part, and it requires new non-traditional programming techniques. "quantum circuits", or "gates", will try to filter out the "solution" amongst the many "alternatives" from the superpositions. or applying voltages etc..), most often encounters all sorts of technical obstacles like decoherence. implementations of qubits and gates, and research in Quantum Information Technology, are some main ingredients in QC. Above, is a very general statement on how it works. However, I hope you will enter the following sections for more details. Chapter 2. Operators, Gates and circuits. 2.1 A few words on classical gates. are performed by "logical" gates like NOT gate, AND gate, XOR gate etc.., all implemented in the chips. more output lines with the result of the logical operation. fast and in large quantities, which ultimately makes your computer to do useful work. "input bits" and the corresponding "output bit". Many of such sort classical gates exists in your computer chipsets. Fig 1. The classical AND gate. except if the output bit is found to be "1". 2.2 A few words on quantum gates. In Quantum Computing, "quantum gates" may play a role too, and it can be a diverse role. In this case, the "physical implementation"
a solid state device, or anything else suitable to 'put" a qubit (or a basis state of a qubit), into another state. on qubits. We need to explain that. We know that the state "|Ψ> = a|0> + b|1>" is a (simultaneous) superposition of the basis states |0> and |1>. If you like, just view |Ψ> as a 2 dimensional vector. If we do not "measure" (observe) "|Ψ>", it's state is unknown. You can easily extent it to an "n" dimensional space, and nothing fundamentally changes, really. but that is not so terribly important for our present discussion. it can only be one of the two "projections" |0> or |1>, which are the two basis states, or also called "eigen" states. which forms a basis for "Quantum parallel processing", but once you measure it, you are left with just one state. So, our quantum states (like a qubit), can be expressed in terms of vectors in a vector space, or "state space" (also called "Hilbert" space). Now, the "traditional" algebra with respect to vectorspaces, also defines "Operators", which maps a vector to another vector. In this sense, the "matrix way" of doing Quantum mechanics works quite the same way. are reversible, preserve certain properties of a state vector, like the "lenght" (or the norm). A special group of such operators (let's call such an operator "A"), have a socalled "conjugate transpose"
operator, notated by A†, for which hold that A . A† = I. "I" then is an operator, which maps any vector onto itself, so, in effect it does "nothing". makes the total operation reversable. to go too much into that stuff. But indeed, for a Unitary matrix M, it holds that M.M*=I. For us, in this text, we treat them all as equal. then c can be seen as a simple 1x1 matrix. Ok, maybe the former statement is a bit shallow, but generally, M x M matrices operate on vectors. Although Quantum Mechanics uses complex numbers in matrix elements, in the simplest case I may use real numbers. Fig 2. 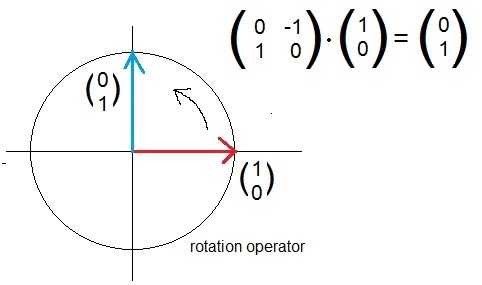 Rotation operator and it's associated matrix. "performs" work along the y-axis. So, this 2x2 object transforms (or maps) the vector (1,0) to (0,1). A great thing of having matrices associated with operators (or gates) is that it enables an easy "calculus" on state vectors. Now, here is a physical problem, and maybe a bit of a philisophical problem too. preserve the "length" (better word: the norm) of a state vector. As a side note: for quantum gates, it is postulated that they must be reversible. Later more on that. of basis vectors, which seems to be a legitimate action. Nothing changes then, does it? I pospone this question to a later subsection. But anyway, according to the math, it's really 'reversable' on the state of vectors. Let's take a look at one of the currently existing quantum gates, and it's corresponding matrix. Quantum gates are supposed to be reversible, and the associated operator is supposed to be unitary. our register will not fully "collapse" into a basis state. on the system, for certain reasons. which may operate on one or more qubits. In section 3 we will try to explain it, and provide for some examples. of the "classical NOT gate". Fig 3. An example of a quantum gate. Swap gate, and quite a few other ones. And you bet.., exciting future implementations are bound to happen. Since a "qubit" is a superpostion of two basis states, and thus a 2 dimensional vector, an operator would be a 2x2 matrix. then an operator would be a 3x3 matrix. then an operator would be a 4x4 matrix, etc.. etc..
gates never erase any information when they act on input bits. You can run the operation forwards or backwards. 2.3 A few words on quantum circuits. We know that |0> is a qubit, and |1> is a qubit, although both are in an "known" state. basis states |0> and |1>. Operator can be represented by a unitary matrix. to draw larger (and more complex) "circuitry". Actually, many physicists in the field, regard designing such "circuitry", as "programming" a quantum computer. By the way: I am not suggesting that a more complex circuit always means that the individual circuits "operating in succesion". It can be more complex than that, but it's not important for this elementary introduction. Fig 4. A few examples of elementary quantum circuits (symbolic representation of a quantum gate). Figure 4 is for illustrational purposes only. Just look at it, and with respect to what I have in mind, that will do. like an electromagnetic field or anything else suitable for that particular implementation of the register of qubit(s). So, there are quite a few elementary "circuits", all corresponding to an operator (and thus a matrix is associated with it too). Typically, building some larger circuit from the elementary "circuits", is often a part of Quantum Computing too. or when you can only expect results with a certain probability. Fig 5. Deterministic output, versus output with a certain probability . - deterministic output (so to speak). where there is a probability of finding a certain value. In the first figure, suppose the upper input is a "|0>", and the lower input is a "|0>" too. Remember, these are just basis states. Then we apply the operator "Px" to the upper qubit. There is no operator on the lower input. Now, suppose that this first gate is a Pauli gate, that maps |0> to |1>. This means that the inputs on the second gate will be |1> and |0>. Since we have not covered all sorts of gates (or circuits), we take for granted that the second gate just "produces" |1> and |1>. on the far right will find. It's certain that "1" will be found. Remember, all qubits in this case were actually all in a "known" state. - output with a certain chance. In the second figure, we do not start with |0> and |0>. No, this time we start with "1/√2 . (|0> + |1>)" and "|0>". So, this time one of the qubits is in an unknown state. Now, the first gate effectively does nothing, so what we have as input for the second gate is still "1/√2 . (|0> + |1>)" and "|0>". The second gate is marvellous for creating entangled systems, and in this particular case, it will give "1/√2 . (|00> + |11>)"
It's an entangled 2 qubit system (see also section 1.4). Ofcourse, it's a superposition of |00> and |11> with an equal chance of measuring either state. So, the measuring devices on the far right will approximately have a 50% chance of finding "0" or "1". and in the other case, probability was unavoidable. to find a basis state with a certain probability. 2.4 A few notes on "bra" and "ket" notation. With just a few quidelines, and some basic knowledge of vectors, it's possible to "follow"
the main lines (or the "red line") of thought on articles on QC. In the sections above, we already have seen some representations of "states" or vectors. 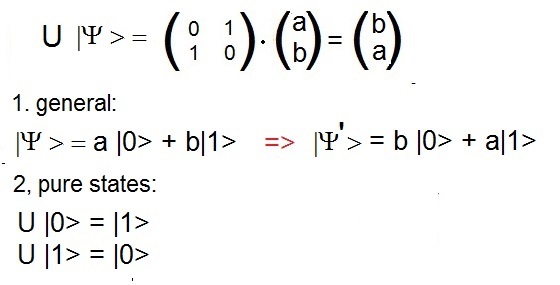 An expression as |Ψ> = a|0> + b|1> might be seen as an expansion of |Ψ> on basis states (basis vectors). Since such vectors are member of socalled Hilbert spaces, it's possible to define the "complex conjugate". Usually, the vector |Ψ> is called a "ket" and the associated "complex conjugate" is called a "bra" and is denoted by <Ψ|. Hence the term "bra ket" notation (by Dirac). The inner product of a bra and a ket (as denoted by Dirac) is then notated as <A|B>. From basic linear algebra, we usually write it as A · B. However, we stick to the "braket" notation. It is further calculated as you know from elementairy linear algebra. Maybe you like to review "math note 12" again. Which is a number, as we also know from elementary vector calculus. Usually, as an interpretation, <A|B> can be viewed as the length of the projection of |A> on |B>. represents the probability that Φ collapses (or "projects" or "change state") to the state φi. where each ai* is the complex conjugate of a1. Ofcourse "Operators" (mappings) are defined too in Hilbert spaces. Above, we already have seen something about it. Indeed, linear mappings, or linear operators, can be associated with matrices. => Here is an example. Suppose we have the mapping "O", and ket |B>. meaning that the columnvector (ket) |B> is mapped to columnvector |C>. where, in our simple model, B and C are row vectors. The above is interresting by itself, but it's also a sort of foreplay to make the following "plausible". |φ > < φ| can be assoiciated with an Operator or matrix. So, it seems to be plausible, that |B > < A| is a matrix, or operator. (1): < A|B > : inproduct, or inner product, usually the projection of A on B. (2): |B > < A| : usually corresponds to a matrix or linear operator. Next, we will spend a few words on Classical Information versus Quantum Information. Chapter 3. Classical Information versus Quantum Information. Above, we have seen something on qubits, and "registers" of qubits (entangled, or not), operators, and quantum circuits. is often regarded as a "key part" of Quantum Computing. Arranging the layout of the circuits, and their order, then looks quite similar to "programming" in classical systems. will try to filter out the "solution" amongst the many "alternatives" from the superpositions. are 4, 5, 8, 12 or, in exceptional cases, a little higher. This is not to say, that a certain "implementation" (which I didn't noticed) uses much higher numbers of qubits. An important question is this: Are quantum computers really "real"? That is, do they already exists today (like now, in july 2015)? It's important to take notice of the fact "quantum algolrithms", since you certainly cannot throw any type of problem on current quantum computers. although the scope will certainly widens up (like calculating on cosmological problems, or high-energy physics). A rather peculiar implementation, by the commercial company D-Wave, is quite noteworthy since they use "sockets" of 512 quantum "elements". I hestitate to call it "qubits", since the folks at D-Wave most certainly use a special type of quantum computing (quantum annealing). D-Wave is quite different from what we have seen in this text, and a few criticists don't believe it's the "real" thing. which then (could) correspond to "the solution" of some problem. That would be quantum computing in my book. If you are interested, you should Google a bit on 'D-wave quantum computing' or 'quantum annealing'. have been succesfully "implemented" (or performed) on (true) quantum computers. But don't forget: the science behind it, and the efforts to achieve it, is mindblowing. What sort of "problems" ("quantum algolrithms"), at this point suitable for current quantum computers, are we talking about? Grover's search algorithm (find a specific item among N other unstructured items). Shor's factoring algorithm (split a number into it's basis prime numbers. Also very likely are cases of pattern matching, or solving specific polynomials etc..
And.., Quantum Computing is actually close to Quantum Teleportation and dense coding. It is generally believed that (true) quantum computers will, for example, have as one of their first practical uses, the "breaking"
of strong encryptions like RSA. Or, the other way around, playing a role in super securing systems. to provide some comparison between a powerful quantum computer and a classical supercomputer. there is a good chance that as a "spin-off" we probably get a better insight in de underlying methods of Nature. that more and more attention will go to this sort of subjects. Here is an example of such an article. For example, "hidden variables" were more or less declared as "dead" since the Bell tests were performed with a sufficient "scientific body". However, you might be amazed by the fact that some top physicists never wrote that concept off. As a serious article on QC which is quite pro "hidden variables" (in a new jacket), you might look at this example. If you are interested, then Google a bit on "hidden variables" and "non locality"
would operate on a certain number of qubits, that indeed a form of "computing" might be implemented. For example, maybe somebody could create an "adder" of a number of circuits, which is a fundamental piece in classical computing. But that's not the key point. It's not the heart of a quantum computer. simultaneously.This, while a classical register can hold only one bit sequence at a certain moment. Now, this really is "a" key point. => Another "typical" element of quantum computing, can be illustrated by the following example. Suppose we have some mathematical problem. before hitting the correct result, while a quantum computer would then need on average "√N" queries. It also means that "the larger a problem is" (N is larger), the "performance" of the quantum computer stands out more and more. need (on average), 100 iterations. apply for Grovers search algolrithm. which also can be seen from the number of "circuits" in a circuit diagram. in accordance of what we have learned in section 2 (operators and gates). Indeed, an "Operator = a gate = a circuit". If you would take a look at the diagram below, it's not a real diagram, like one that really exists with classical circuit boards. It only represents the Operations (thus circuits), performed on the qubits one after the other. Note that the "input register" then converts (so to speak) to the "output register" after all steps are done. However, a seperate ouput register coud be possible too. Fig 6. Diagram with circuits, representing the operations, or circuits, performed on the input. .
Hopefully, you now have a "better" idea of a typical small-scale quantum computer, as is often used in lab setups. Start with a number of qubits, say 8 qubits. Initially, they all might be in the pure |0> state. Then they might be put in a superposition, or entangled state. Due to how a number of current quantum algolritms work, the input register might then represent all possible solutions of a certain problem. in an efficient way (or at least, different from a classical approach). need this to happen as a first step, and how the quantum algolrithm is implemented in this particular setup. of the algolrithm. These steps just depends on the algolrithm that is used in this particular case. Physically, the "circuits" are laser pulses, or radio waves, or whatever physical event, in order to map the state of the qubits. as expected with the algolrithm. It's important yo know, that the "input" register might also function as the final "output" register. are involved. Some of the algolrithms shown above, were succesfully performed in such setups. It's not so easy to demonstrate it, since a good-working knowledge of number theory is required. But, a "Jip and Janneke" explanation is possible, and I shall use Grover's search algorithm for that. It's possible to introduce this one, with only a minimum on math. The figure below, tries to illustrate a classical search versus a quantum algolrithm. Fig 7. Classical search vs Grover's quantum algolrithm. Suppose you have "N" unordered numbers to choose from. Suppose only one is searched for, or in other words, is the correct one. to work it's way through a table, until that particular value is found. Suppose an unordered table has 100 unique records. You only need to find one particular record. Classically, on average, how many "trials" would you need? On average, it's about "N/2". have no luck, you might need (for example) 87 trials before you hit the right answer. you need "N/2" queries on average, before hitting the right answer. So, suppose N=4, on average, we need 2 queries. Suppose N=100, on average, we need 50 queries. Etc.. etc..
Ofcourse there must exist some "Oracle" which knows precisely the record we are looking for. If the Oracle is a "classical query", then it might be something like "SELECT * FROM TABLE WHERE RECNO=55". The query just needs to plough through the table until this specific unique RECNO is found. Keypoint is, that there must exist a function, or query, or whatever, which knows the value we are looking for..
using some query, or function, or something like that. We only want to compare such a classical way of doing things, with a true Quantum Algolrithm. Globally, the quantum algolrithm works like this. It's based on "amplitude amplification", or sometimes also known as "inverse the rest, except the solution". Suppose we want to try Grover's algolrithm using 3 qubits. has an equal probability to be found (when measured, or observed). Then, Grover's algolrithm will be "applied", in a number of "iterations", where ofcourse our goal is, to minimize those iterations. We have 8 qubits, all in the state "0", so we must correctly describe it as |000>. Since in this case, we know that all three are known to be "0", the 3 qubit state then must be |000>. in a superpostion where each state has an equal probability to be found (or to be measured as the last step). This also can be interpreted as that each state has the "same amplitude" (thus the same probability). For this step, the Hadamard transform (or Hadamard gate) can be used , since it maps n qubits which are "0"
into a superposition of all 2n states with equal "weight", that is, equal probability. Where the superscript 3 means that we have 3 "inputs", and the "H" means that we use the Hadamard gate. by the quantum algolrithm. So, we could choose |010> or |111> or anyone of these 8 components. Step 4: marking the Solution. Now, one Quantum feature of this quantum algolrithm, is to "inspect" all entries at the same time. Note that! This is not to be taken lightly. like implementing a "phase shift" or "inversion", or anything else, on the components. knows what to look for. It only needs to plough through the table. This is also true for a special function, called the "oracle". That function has knowledge of which state we need to find. Using a certain phase shift, the function will invert the amplitude of the |111> component, without modifying it furher. For the other components, it does nothing. of all components is still the same. However, we can say that the solution is "marked". Step 5: Applying the "diffusion" operator in "iterations". We can now use a (series) of gate(s), which "diffuse" or lower the amplitudes of the unmarked components. At each iteration, those amplitudes will get lower, so the marked solution will stand out more and more. The "art" is ofcourse, to use the minimum needed number of iterations. solution |111> when a measurement is performed. the correct answer. The larger "m" is, the better that chance will become. performs compared to the classical case. - Classical search: you need on average "N/2" iterations. - Grover's search: you need on average in the Order of "√ N" iterations. When N gets larger and larger, the more the quantum algolrithm "stands out" to be better performing. This algolrithm was translated by me here, in a sort of "Jip Janneke" language. Hope it helped a bit. quantum algolrithms take a 'true' advantage of an exponentially increased computing space. These can be found in more advanced notes. However, the principle of "universal computing", applying to quantum computers, is established.